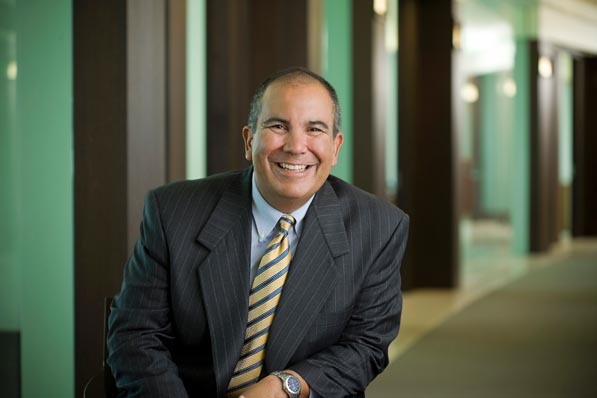 California-native Michael Torres is proud to be a third generation Mexican-American, and as CEO of Adelante, a boutique real-estate-investment-management firm, he strives to serve as a role model in the Hispanic community. With 25 years of real-estate experience tucked under his belt and plenty of entrepreneurial spirit, Torres continues to make a strong impact in the world of real-estate investment. It’s something I’ve accepted all my life. I’m the eldest of five kids. It’s just the way I live my life. If you don’t have it, you’re not going to get trust. There’s value in a handshake. The view is always different when you lead and I enjoy it. After working in the family business and returning to Berkeley for business school, I joined Prudential Mortgage Capital in Los Angeles to originate commercial mortgages in 1986. After working on a large portfolio loan to Catellus Development, I requested a transfer to Prudential’s Newark, New Jersey’s corporate office to work on the national accounts team. This team interfaced with the major investment banks on large portfolio financings. Part of my ambition was to grow into a leadership position, which I learned may take years in a large corporation. I learned more about myself in those two years; less corporate and more entrepreneurial and that the West Coast will always be home. In 1990, I returned to southern California to join Wilshire Associates, an investment-consulting firm, which had a very entrepreneurial culture and I thrived. Wilshire is well regarded institutionally and enabled me to establish a personal brand within the commercial real-estate-investment-management industry. While there, I developed the Wilshire REIT Index, which helped launch the modern REIT-era in 1991. Since the late 1980s savings and loan crisis, the real-estate industry has matured and public ownership and management thrived as a result of securitization. Over my professional career, the market capitalization of the public REITs has grown from $6 billion to more than $450 billion and rewarded investors handsomely! In 1995, I joined a start-up investment-management firm and grew our assets under management to more than $1.7 billion before being acquired in 2002. I was named CEO in 2002 and lead a 15-person investment team. In 2004, our new owner decided to exit the business and I formulated a plan for management buyout. With a successful transaction and financing, I rebranded the firm, Adelante Capital Management. My team could have joined a large financial institution, but I felt a duty of loyalty to my clients. The best course of action was to secure the firm’s independence and buy the business. We could not have done it without our clients, who overwhelmingly supported the deal. Additionally, I was fortunate to have arranged the financing so that when the opportunity for the MBO arose I was ready. That’s where preparation and opportunity meet; all too often, people get opportunities in life and aren’t prepared for them. This time, I was focused and ready to go, even though there was the possibility I would lose. I chose [the name] Adelante for two reasons. First, my 11-year-old son recognized it immediately and said “forward.” Secondly, the name was very important to me, because I was moving forward with the business I had helped create. In 2004, there were maybe three other Hispanic-owned institutional investment-management firms in the entire country. So, one of my goals with the business was to serve as a role model for the Hispanic community. A secondary benefit has also emerged, were many of the pension-fund beneficiaries are Latinos, so they can appreciate that another Latino manages their money. As the world continues to become multicultural, I have great pride in my heritage, and I hope that my experiences won’t be lost on those that come after me. Our goal over the next five years is to grow our assets under management to more than $5 billion; currently we manage $2 billion. We strive to be a globally recognized investor and are proud to be a Latino-owned investment management firm.